Volkswagen has done it. After all of the teasers and development advance stories, the new I.D. R racer set out to take the speed record for the Pikes Peak Hill Climb and it did. 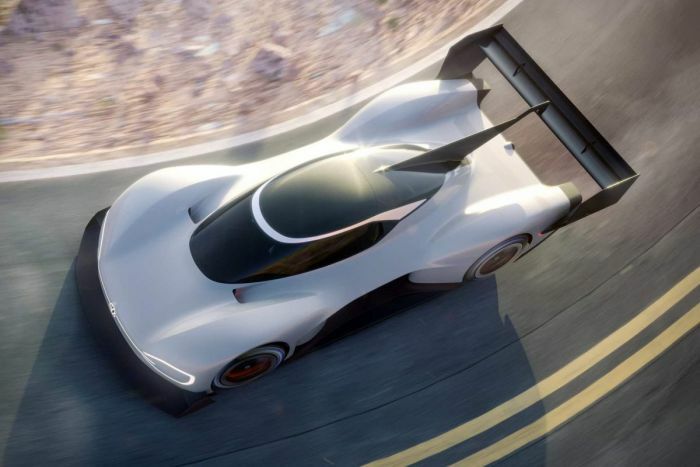 For months, we have seen teasers and stories about Volkswagen’s Pikes Peak Hill Climb challenger, the I.D. R electric race car. As the race came closer, so did looks at the technical side of the racer. As well as some of the design specs that were needed to grab the record. In fact, the record is one of the reasons that VW came out with the I.D. R (Pikes Peak). VW had its corporate mindset on breaking the record and so apparently little was spared as they developed the first member of the I.D. family released to the public. The I.D. family will be at the heart of VW’s move to electric cars. The family will have five separate vehicles, the racer, the I. D. Hatchback, the I.D. Buzz MPV (multipurpose van) which bears a striking resemblance to the old Microbus, popular in the 1960s and 70s, the I.D. Crozz and the I.D. Vizzion. Meanwhile, back on the mountain, today the I.D. R Pikes Peak racer not only took the new record, but, in doing so, the driver, Romain Dumas, the current champion, ran it under the wheels of the I.D. R racer, setting a new mark that is nearly a minute quicker than the old mark. The old mark was set in 2013 by a Peugeot 208 T16, driven by Sebastien Loeb. His record was 8:13.878, while Dumas’ time was 7:57.148. Interestingly, though the race ended yesterday, the official numbers won’t be available until tomorrow when they are all finalized. The last time a VW was involved in the Pikes Peak International Hill Climb was in 1987. The entry was in a unique Group B Golf. The rally car had one engine powering the front wheels, while a second engine powered the rears. As it ran the 12.4 miles race up the mountain, you could tell it was quick. However, just as the dual-engine Golf raced toward the checkered flag, the suspension ball joint failed, and Jochi Kleint was unable to take the flag. For its new entry, VW built a prototype EV (Electric Vehicle) with 680 horsepower and 479 pounds-feet of torque. A 43-kWh battery sends juice to each wheel of the all-wheel-drive race car. At this point, the racer can leap forward hitting 62 in 2.25 seconds, which is the domain of supercars. Indeed, the I.D. R is honestly a race car. The total weight – with Romain Dumas behind the wheel – is less than 2.425 pounds. EVs, used in venues like Pikes Peak Hill Climb, take advantage of each part used. The rear wing, for example, is key to the I.D. R. It generates the downforce necessary to handle the thin atmosphere.